The object of this report is to summarise the effects of co-trimoxazole prophylaxis on morbidity and mortality among HIV-infected individuals. In HIV-positive adults not receiving antiretroviral therapy (ARV), a Cochrane Review (including three randomised controlled trials (RCTs)) found that co-trimoxazole prophylaxis reduced the risk of death by almost a third (Table I).3 The beneficial effect was similar for early (CD4 >200 cells/µl) and advanced (CD4 <200 cells/µl) disease. The frequency of admissions to hospital and the incidence of bacterial, parasitic and Pneumocystis carinii pneumonia (PCP) infections were also significantly reduced (Table I). A further RCT among HIV-positive adults in Malawi newly diagnosed with tuberculosis4 found no significant difference in bacterial pneumonia (hazard ratio (HR) 1.07 (95% confidence interval (CI) 0.56 - 2.06)) and the probability of survival (HR 1.11 (95% CI 0.72 - 1.71)) between participants allocated 480 mg v. 960 mg of co-trimoxazole. In children, support for co-trimoxazole prophylaxis came from a randomised placebo-controlled trial (N=541) conducted in an area in Zambia with high levels (60 - 80%) of in vitro resistance to this antibiotic.5,6 Children <5 years were given a daily dose of 240 mg co-trimoxazole while those >5 years received a daily dose of 480 mg. Co-trimoxazole significantly reduced mortality by 33% (RR 0.67; 95% CI 0.53 - 0.85) and hospital admission rates by 23% (RR 0.77; 95% CI 0.62 - 0.95). Follow-up was reported to be excellent and few patients stopped their medication. The beneficial effect was seen across all ages and CD4 counts, and effectiveness of the drug did not diminish during periods of use up to 18 months' administration. No randomised studies provide information on the optimal time for initiating prophylaxis in adults, or on when to stop prophylaxis. None of the trials included in the review focused on patients receiving treatment with antiretrovirals. Current studies neither report on the effects of prolonged co-trimoxazole use on bacterial resistance nor evaluate whether co-trimoxazole affects resistance of malaria parasites to sulfadoxine pyrimethamine (with which co-trimoxazole shares a component). Co-trimoxazole is highly effective in reducing mortality and morbidity in HIV-infected adults and children not receiving antiretroviral treatment. Similar benefits are seen in early and advanced HIV disease. 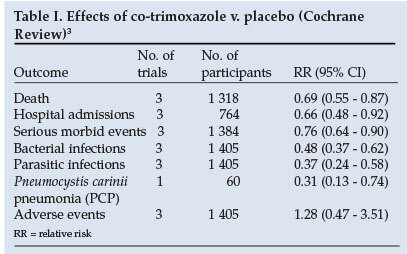 Co-trimoxazole is well tolerated, with minimal side-effects. Further research is required on the optimal time for commencement of co-trimoxazole prophylaxis and to evaluate its use in patients on antiretrovirals. We thank F Desai, E Goemaere, Gail Kennedy and George Rutherford for their valuable feedback.